According to Table 2, the 3 enfolded Type B polygons have 81 triangles with 186 corners & sides. The root edge has two corners and one side, so that 180 corners & sides outside the root edge surround the centres of the 3 polygons. The centres of the (3+3) enfolded polygons are surrounded by (180+180=360=36×10) corners & sides. 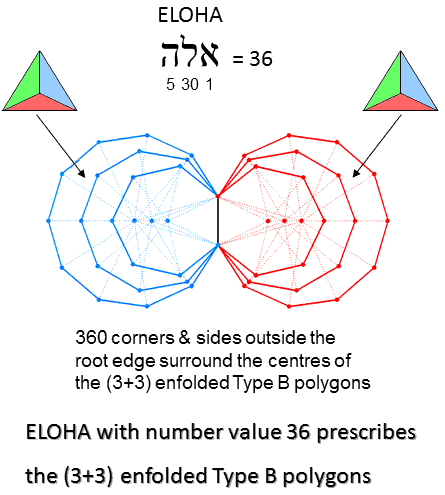 ELOHA, the Godname of Geburah with number value 36, prescribes the (3+3) enfolded Type B polygons. Table 2 indicates that the 3 enfolded Type B polygons have 400 yods. Of these, 81 are hexagonal yods at the centres of 81 tetractyses. (400−81=319) yods line their 133 sides. (319−4=315) of these are outside the root edge, so that the (3+3) enfolded polygons have (315×2=630) such boundary yods. 630 is the number value of Seraphim, the Order of Angels assigned to Geburah.